Walking the paths and paved streets in Finland. Or elsewhere. And loving it. 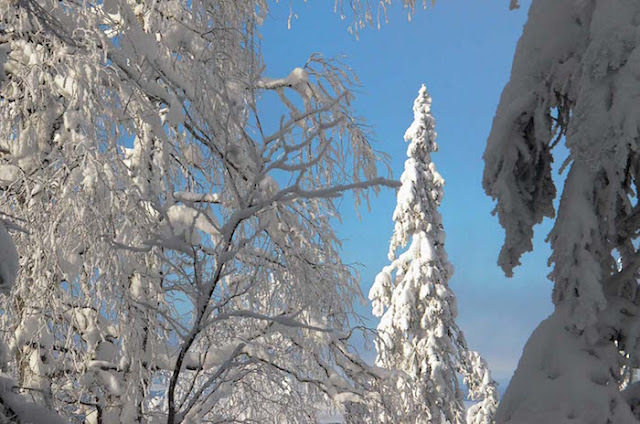 Koli, the best known attraction of North Karelia in Finland, has many hidden treasures. 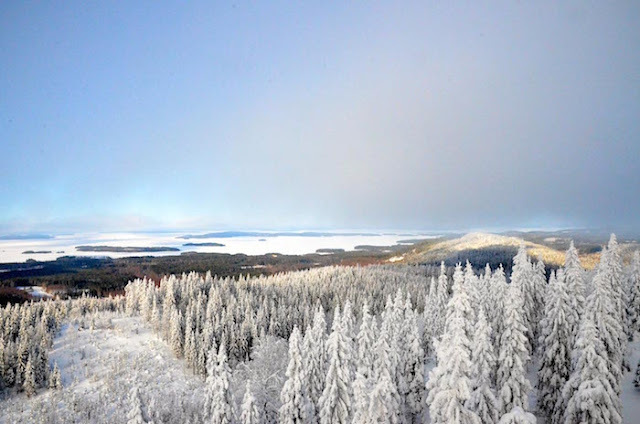 I'd heard that one such place is Räsävaara, a couple of kilometres off the most popular part - the peak of Ukko-Koli. On my previous trips to Koli I had planned a visit there but had never managed to make it (so many other things to do there!) so I finally decided to give it a go. 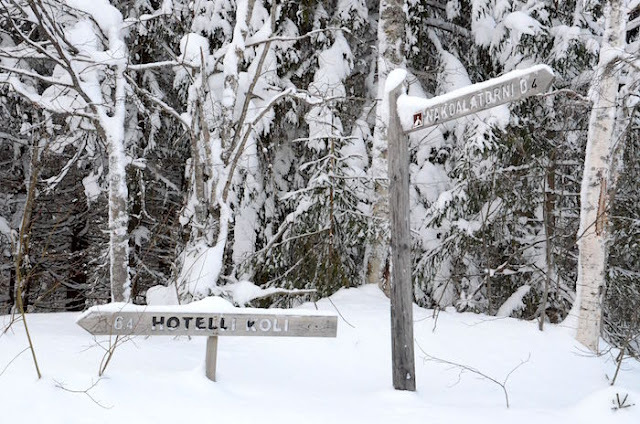 I left Ukko-Koli via the trail that starts from the hotel to the Koli village and saw immediately that snowshoes were not needed. Not just yet. The trail went downhill for almost 3 kilometres and I stopped for a cup of tea at Kolin Ryynänen before continuing my walk towards Räsävaara by the side of the road. After the village, there is no footpath for us walkers... So better tread carefully and beware of cars passing by. 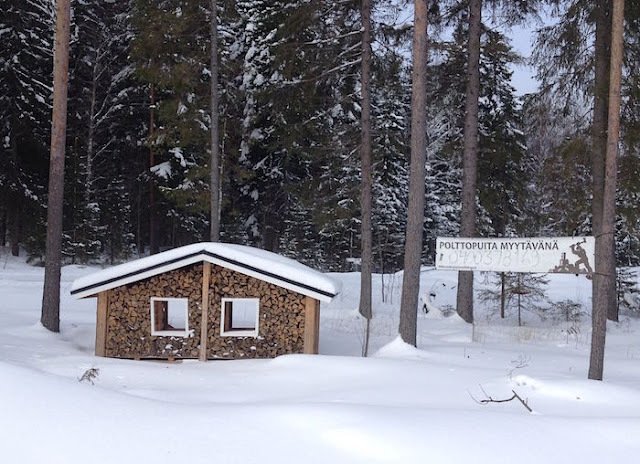 Firewood for sale...What a hilarious firewood house! 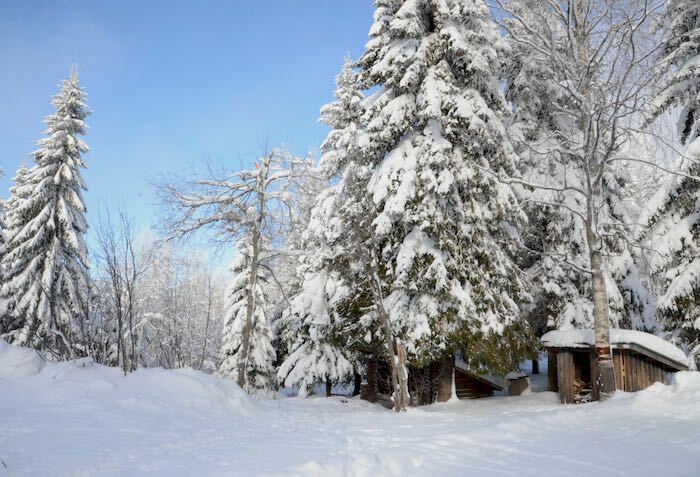 There was no point in wearing snowshoes just yet; why make the trip harder when you have a normal road to walk on. Of course I could have tried to take a shortcut through the woods but I didn't have a good map with me so following the signs to Räsävaara was a better option. I walked about one kilometre from the village until I reached the sign to the right; Räsävaaran näkötorni (observation tower) 3.2 km. I had forgotten about that! Again, I felt silly just carrying my snowshoes and not wearing them! But wearing them and just snowshoeing by the road didn't make sense either so I thought I'd take it easy. The road turned to the left and I met a cross country skiing track marked by Ahmanhiihto signs. The event takes place around mid March every year. 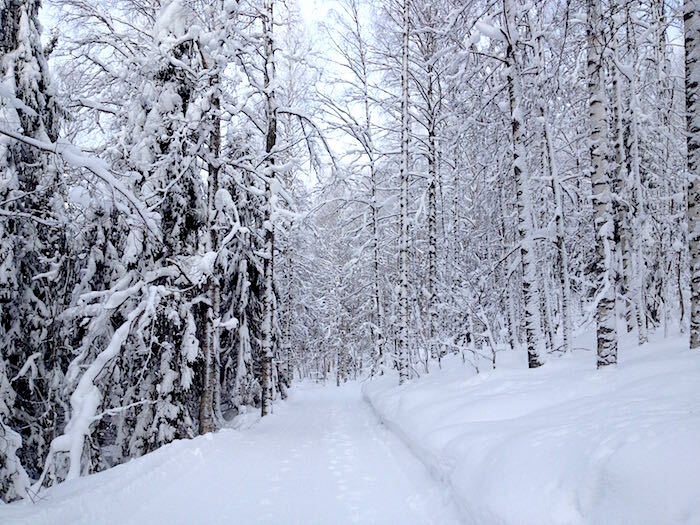 I saw only one person skiing along the trail while walking beside it, but imagined that the trail would be extremely crowded at weekends. I had the road all to myself. There were no cars driving past. The silence was fantastic; it gave me a perfect opportunity to simply enjoy the peace and quiet, to admire the snow and frost covered trees. I spotted some orange dots on the trees, revealing that I was also following a long-distance hiking trail called UKK Trail which runs in Eastern Finland and Lapland. UKK Trail is a summer hiking trail so it was no wonder that there were no footprints (not even those of snowshoes!) in the virgin snow when the trail turned off the road, to the left. The slow and long ascent finally took me to the foot of Räsävaara's peak and it's lean-to shelter (laavu) which was deserted. I had been expecting to see a trail of smoke rising from there but there was nobody having a break in front of an open fire. There is ready-made firewood available for anyone who wants to sit down and just enjoy the moment in front of an open fire. Howeverm remember to bring your matchsticks and don't use more firewood than necessary! Behind the log shelter, Räsävaara rose higher and I spotted yet another sign to the observation tower (näkötorni). The sign was pointing upwards to a steep slope and there were some footprints. The other alternative would have been to follow a snowmobile trail to the top but that was much less appealing! I finally fitted the snowshoes on my boots and began the ascent to the top. Yes, it was steep. But not for long, luckily, because I rarely carry hiking poles with me and had left them behind, as usual. I know skiing or hiking poles can be extremely useful in the snow but when you've got a camera with you, it's not very convenient! 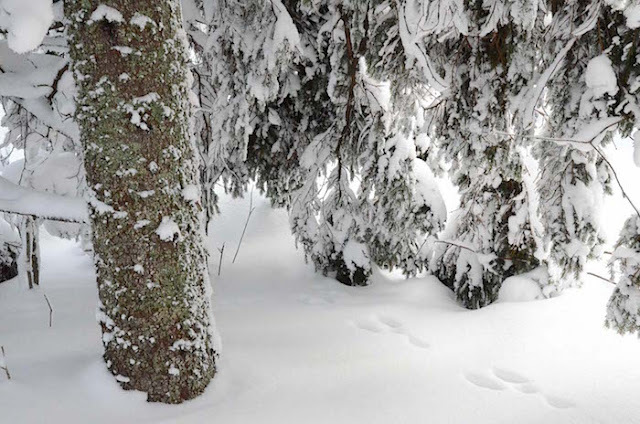 It was interesting enough to follow the previous walker's footsteps because he (or she) had not been wearing snowshoes so the footprints were pretty small and deep in the snow. Very soon I realized it was easier to step on untouched snow and it became much easier to continue my journey amongst the fir trees and birches covered in lacy frost and heavy coat of snow. 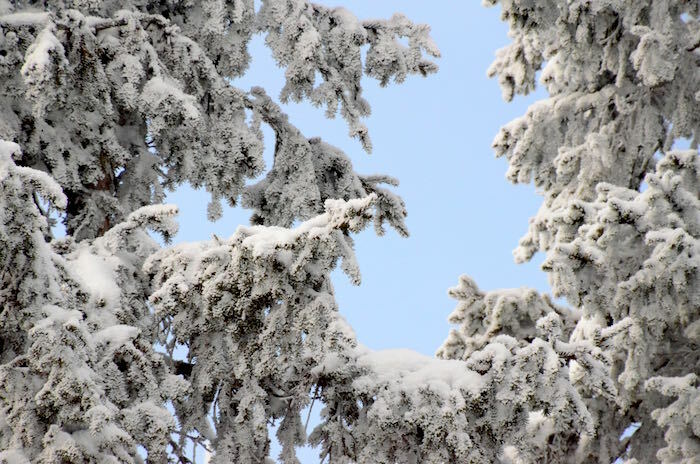 There were so many different shades of blue up in the sky and the white trees were as if from a fairytale. Where are the elves? Hiding beneath the trees? Gently shaking snowflakes from the treetops as I pass them by? I scanned the view ahead and wondered where the observation tower was. There were no paths visible so all I could do was to see where the land was rising and keep going until I would reach the highest point, in the hopes of finding the tower which might well be hidden among the trees, perhaps just as tall as them. There were plenty of other footprints on the crisp snow. Most of them were those of hares of whom there are plenty in the area. When I glimpsed between the trees towards Ukko-Koli, the view was mostly obscured by mist and clouds over there although I could see the sun and blue skies on the other side of Räsävaara. I could also see the huge expanse of Lake Pielinen in the distance, all white and flat between the mainland and islands. How beautiful! But I still couldn't spot the observation tower. Then, all of a sudden, I saw it. The simple, tall structure made of wood, reaching up towards the sky. A solitary, quiet figure guarding the snowy forest and the view around it. 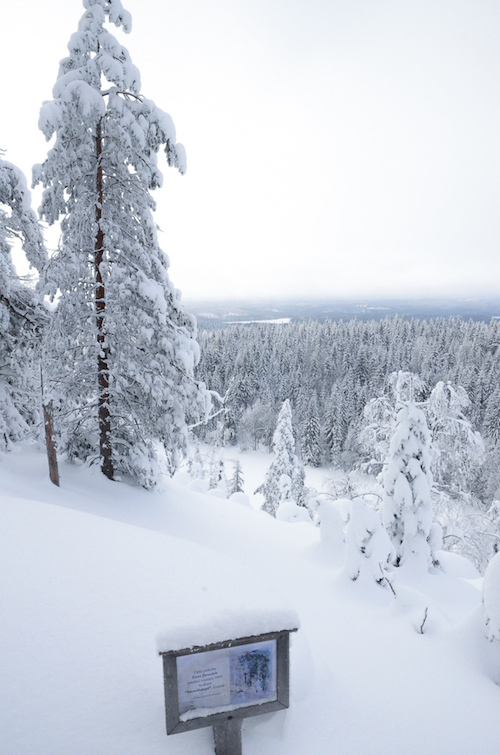 I walked slowly towards it and took off my snowshoes before starting my ascent to the very top of Räsävaara. It was a slippery climb up the icy steps but I made it! There was a bit of wind up there, so I was glad to have a hood in my jacket. A simple woollen hat wasn't quite enough. But what a view! There is a fabulous 360 degree view to the whole Koli area. The hills (vaara), lakes and the neverending forests, mostly coniferous. Just imagine what this will look like in the spring, in the summer, in the autumn... All the different colours the nature can offer in different seasons... Already, I began to think what it would be like to be here in when the leaves have turned golden. Oh yes, even if there are mostly fir trees, there are plenty of birches and other deciduous trees that change colour in the area. 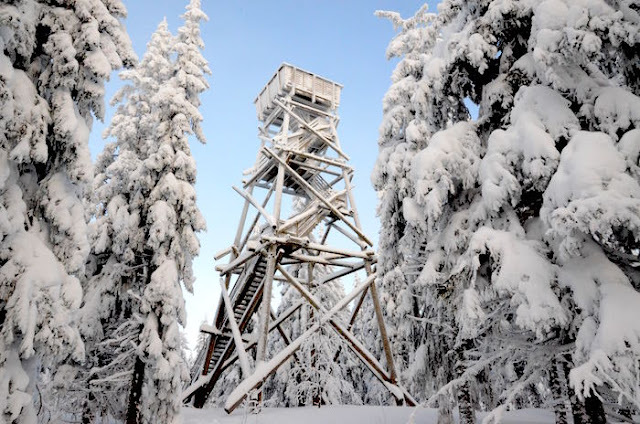 Räsävaara isn't the only hilltop that boasts obeservation tower in Koli; there is another great one at Ryläys, but Räsävaara instantly became my personal favourite. The movements of shadows and light, clouds, mist and different colours were simply enchanting. And I've never been able to resist a view from the top. The world beneath my feet. After saying goodbye to the shadows and tall trees from the very top of Räsävaara, I again took my snowshoes and made a short detour to the edge of the hill. To my pleasant surprise, I stumbled upon a sign that reveald this spot to have been the inspiration for Finnish artist Eero Järnefelt's gouache Metsälampi (Pond in the Forest) in about 1895. His artwork depicts the scene in the summer so I couldn't exactly determine how the scenery had changed since but thought it would be interesting to see the original artwork. I wonder where the gouache is these days. Someone had written I l♥ Koli on the frosty railing of the wooden observation tower. No, I not me! It was there before I climbed up! But it could have been me - I love Koli! I truly felt I'd found a hidden treasure of Koli and know for sure that I will return to Räsävaara some day. Until next time, Räsävaara. Walking blog. I walk to discover the world around me - whether a few steps away in my home town Jyväskylä, Central Finland, or elsewhere. Photos & texts © Kenkä. Copyright: Kenkä. Simple theme. Powered by Blogger.